Finding the best soldering station for your applications is very essential. The temperature controlled soldering station has become a must have in today’s laboratories. With the increasing technological advancements, ICs and their components have become more complicated and delicate. They require advanced soldering irons with more functionality. 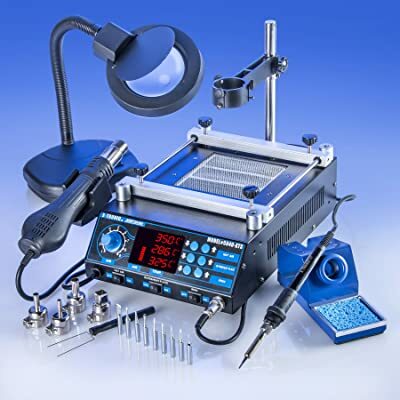 Here is a review of top soldering stations to aid you in your search for the perfect soldering station. Here’s our picks for the Top 7 best soldering stations, to help you get the most value for your money. Check out the many useful soldering station reviews found here. 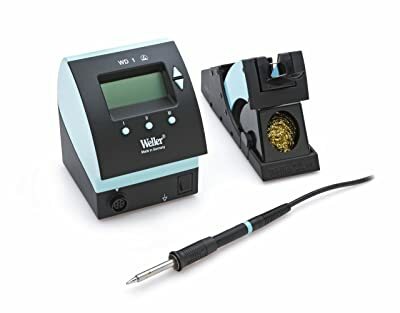 This is an intelligent soldering station that is equipped with a quality control processor and achieves lead-free soldering and de-soldering. The processor ensures precise and stable temperature control and also ensures the solder iron heats up quickly. The iron’s switch is fitted in the handle which enables easy switching on of the device. When the handle is let go, the soldering station automatically enters into standby mode. Further, it has self-testing and self-protection functionalities which make it even safer. There is an included 15V DC power supply and a meter test that can be used for testing mobile radio signals. This makes it ideal for repairing mobile phones. 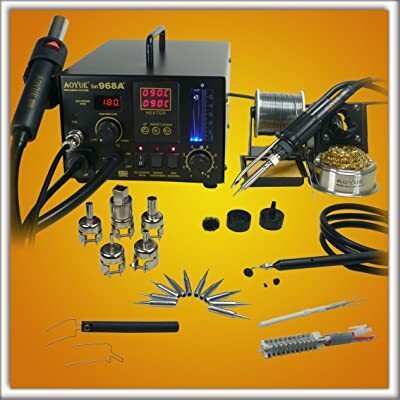 The entire package comprises 1 solder iron heating element, 1 hot air heating element, 1 soldering wire, 1 soldering paste, 2 tweezers, 4 nozzles and 10 iron tips. 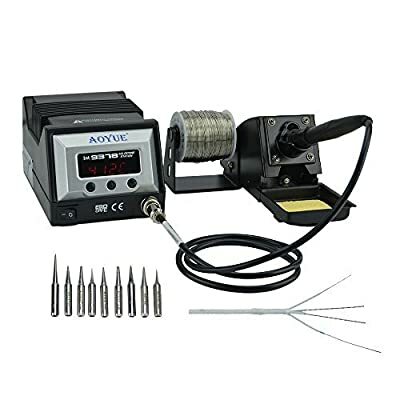 This is a reliable and efficient soldering station that gives you rapid heat-up and temperature recovery. It is fitted with a wireless temperature lockout that will prevent the temperature from going above a specified limit for the board or component. There is an attached, easy-to-understand LED light that displays the WES51’s mode. After 90 minutes of inactivity, it automatically shuts down to reduce power usage and extend durability. It is an ideal soldering station for a wide variety of uses and is good enough for use in a continuous production environment. The kit’s PES51 soldering pencil is made of stainless steel wound with Nichrome. This material is not prone to corrosion and has quick response time. Its lightweight handle is made from high-impact electrostatic discharge (ESD) plate while the cord is made from non-burning silicone rubber cord. For further comfort, the handle has been fitted with a foam sleeve that helps reduce fatigue and heat discomfort during use. The entire packaging comprises a soldering pencil, power unit, stand and sponge. This is a very powerful and quality soldering iron. It is fitted with a pencil-type, 70 watt soldering iron that is fitted with a handy smoke absorber. The smoke absorber is very efficient in absorbing the fumes created when soldering. A microprocessor has been embedded into the kit to ensure precise temperature and airflow control. The microprocessor also has a digital calibration feature and an adjustable sleep timer. A digital display has been fitted to display various parameters to the user. The heating core system has a self-testing function that warns the user when the heating core deteriorates or breaks down. After use, the kit employs an automatic cool off function that leaves the blower on until the heating element cools. This improves the durability and safety of the heating element. The packaging comprises a soldering iron, digital display, soldering iron holder, vacuum pickup kit, spare heating elements and 10 soldering iron tips. 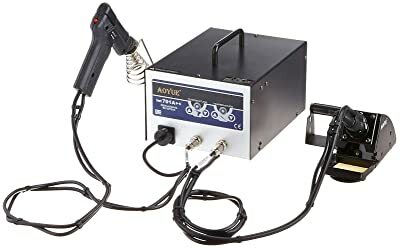 This soldering station features a 70W soldering iron, 500W hot air gun and a 700W preheating station. A microprocessor has been integrated for precise temperature control. The proprietary Magic Temperature Control Technology is responsible for this. It works by checking the temperature of the soldering iron every 20 milliseconds and correcting if the temperature has deviated from the set temperature. The kit has an LCD display included to display various parameters of the soldering iron. A Self-Test function is also included that checks on short circuits, overloads and extreme temperatures. 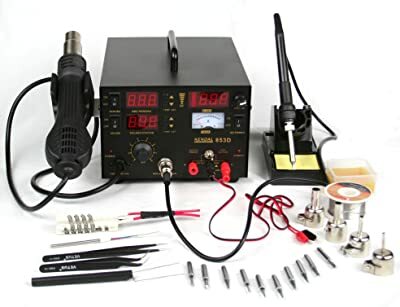 The entire package comprises a soldering iron, power unit with LCD display, 4 hot air nozzles, pinpoint tweezers, IC popper, Gootwick and 5 Mag Lamps. It is very versatile and can handle just about any precision job you need. This is an ESD Safe CE and RohS compliant soldering station. It has an embedded microprocessor that provides precise temperature regulation. The digital thermostat has a switchable Fahrenheit/Celsius readout and 2 quick jump buttons for instantly applying two pre-programmed favorite settings. The solder iron’s handle is made of rubber and is very comfortable during use. It has been equipped with a vibration sensor that detects movement. Other cool features include a programmable sleep function, a digital LCD display and a system lockout feature. The package includes the power unit, soldering iron and 10 soldering tips. It is ideal for low frequency usage on applications with minimal demands. 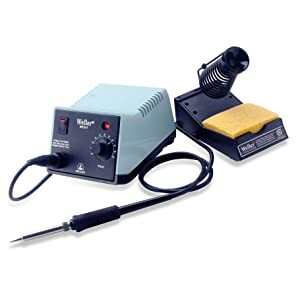 This soldering station comes with independent soldering iron and de-soldering gun. The powerful 70W soldering iron has a ceramic heater which has longer useful service life than conventional heating elements. The unit has a maximum 24V output that helps prevent circuit damage from the soldering iron. There is no crossing circuitry in the power unit to prevent electrical surges. The entire package comprises the power unit, de-soldering gun, de-soldering gun holder, de-soldering tips, soldering iron, soldering iron holder, soldering tips, nozzle cleaning pin, 6 filters, a filter spring and a power cord. It is perfect for performing repairs and detailed modifications. 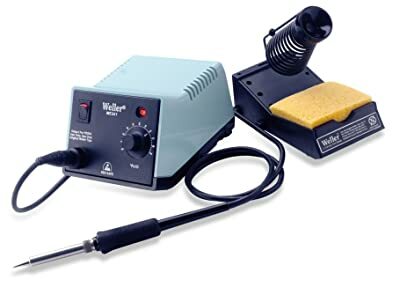 This is a powerful and versatile soldering station. It is fitted with a powerful 80W pencil that allows for rapid heating and the heating element is made of special silver. This silver has low thermal loss and fast recovery which makes it perfect for continuous production work. It is also ideal for handling high mass components and other highly demanding applications. It has an interchangeable barrel that enables you to work with a traditional length grip or a shorter one to enhance grip. The station has 3 fully programmable and independent preset buttons that allow you to program a preset temperature for each button. The pencil’s stand has been applied with an anti-static finish to protect against electrostatic discharge. It also has a fou-position tilt that can be adjusted to your desired angle. The entire package comprises a WD1 power unit, WP80 pencil, WDH10 stand, WDC2 dry cleaner and a user manual. As with any equipment, a little bit of common sense when using a soldering station like the WES51 will go a very long way towards properly maintaining your tools and ensuring you get many years of use out of them. I have compiled a quick list of suggestions collected from my experiences over the years – learn from my mistakes and don’t risk damaging your own equipment! 1. Never drop the soldering iron while it is hot. It may sound obvious but due to the way soldering irons work dropping them can damage the thermal components. 2. If your soldering iron is going to be left on for some time while you are not actively using it, set the temperature to the lowest possible setting. This is especially easy on units like the Weller WES51 and WLC100, just turn the temperature dial all the way down. 3. Never, ever disconnect your soldering iron from the station while it is switched on, it could short out and ruin your soldering station. 4. In the same vein – never take the soldering tip out of the iron while the power is on. This can completely destroy the thermal equipment or severely shorten its lifespan. 5. Don’t use a sponge that is soaking wet to clean the tip – make sure it is just damp. If you use a sponge that is really wet for your tip you will a) lower its temperature quickly and b) damage it. 6. If you have a soldering iron that is broken or faulty, do not plug it into a working base station. 7. To extend the life of your tip always keep a good layer of solder on the end of the tip – this will stop it from oxidizing and help extend its life. That’s it, just keep a few points like this in mind while soldering and you will find your equipment keeps on going strong for years. Soldering iron station is certain equipment consists of soldering iron, electrical power supply, as well as the base. This product works well to help people get precise control of the temperature of the soldering iron well. Besides, compared to any standard soldering iron, soldering iron station will have more flexibility. Since this equipment is very useful and practical, a lot of people prefer soldering iron station than standard soldering iron. Mostly, they prefer this equipment since it has some useful features that they can not find in standard iron. Most of the soldering iron station products are completed with digital read out to display the temperature. Therefore, you can easily maintain the appropriate temperature to support your job. Besides, some products are also designed to be very flexible and portable. Cordless rechargeable soldering iron station is available if you often move from a certain working area to another. Therefore, you do not need to stick in a certain work area just because you find much difficulty in moving your product. In addition, you can also find soldering iron station that is completed with interchangeable soldering iron tips. This feature will be helpful if you deal with wide variety of medium to be soldered. There are a lot of products of soldering iron station available in many suppliers and stores, so you can always find the most appropriate product that matches your requirements well. Before you go to a certain store or supplier, it will be better for you to read our review first. It gives you some preferences of popular and high quality soldering iron station that might fulfill your requirements well.